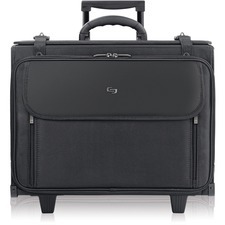 Rolling Laptop Catalog Case features a removable, padded CheckFast sleeve in the main compartment. The sleeve holds 17" laptops. Removable, hanging file folder frame includes hanging file folders. Design also features zip-down organizer compartment, accordion fan file, disk/accessory pockets, dual lockable speed buckles, and external zippered pockets. Carry with top handle or pull with telescoping handle system. Catalog case is made of ballistic poly. Minimum Screen Size Supported 15.4"